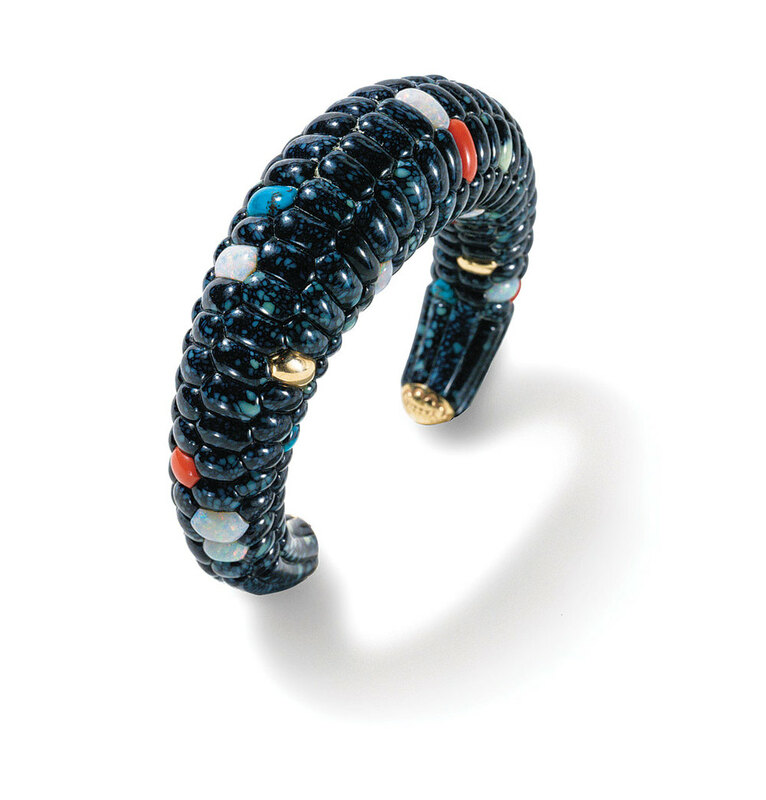 BRACELET by Raymond C. Yazzie of silver, coral, turquoise, lapis lazuli, fourteen karat gold, 6.03 x 2.54 centimeters, 2005. Collection of Mark and Martha Alexander. Photograph by Michael S. Waddell. Photographs courtesy of the National Museum of the American Indian. Entering into the exhibition hall of “Glittering World: Navajo Jewelry of the Yazzie Family” was a carefully cultivated experience. Guest curated by Lois Sherr Dubin, author of North American Indian Jewelry and Adornment, assisted by associate curator Kathleen Ash-Milby (Navajo) and put together by assistant director of exhibitions and programs Peter Brill, “Glittering World” was an example of elements considerately placed to both educate and lead the viewer through a tightly woven visual narrative. The exhibition, not only a repository for some of the best contemporary Native American jewelry, was also a work of art in its own right. The Yazzie family is composed of sixth-generation silversmiths from Gallup, New Mexico. Born to Chee and Elsie Yazzie, both of whom worked with silver, nine of the twelve Yazzie children became jewelers. The recent exhibit featured jewelry from the whole family, with most of the focus on the work of two brothers, Raymond and Lee Yazzie. Raymond and Lee have created superb jewelry from their earliest years, some examples of which were on display. But most of all, their recent body of work was gloriously present for the public. Taking place at the National Museum of the American Indian in New York City, in the noble facade of the Alexander Hamilton Customs House, the exhibition was a sensorial journey. From the entrance, one was guided through two rooms—the first put into perspective Navajo and Indian symbolism, motifs and culture, while the second introduced the background of the artists and the environment in which they grew up. These portions of the exhibition set the tone for the rest, while subtly informing the viewer as to the visual alphabet behind what they were about to see. BELT BUCKLE by Lee A. Yazzie of Lone Mountain turquoise, sterling silver, 6.03 centimeters long, 2000. Collection of Gene and Ann Waddell. Photograph by Kiyoshi Togashi. Native American art is founded on an aesthetic and spiritual tradition where nearly everything represents some element of the world, of the spirits, and of nature. The exhibit explored several of these motifs, such as the Yei, or Holy People, and the vital essence of corn, the food crop which nourishes the Navajo. The Yei are divine beings that live within the mountain mists, and like many entities in the Native pantheon bear similarity to other spirits, such as the Hopi Katsinas. Some might call them different faces of the same thing, aspects of nature and life who play instrumental roles in how the world is governed and blessed. Panels were devoted to giving a brief and instructive summary of each symbol and paired with a piece of Navajo art that depicted it. A side-room presented a taxonomy on the various types of turquoise. A piece of jewelry made by a member of the Yazzie family was partnered with a raw nugget of a specific type: Lone Mountain, Blue Gem, Lander Blue, New Lander Royal Web, Bisbee, Kingman. This overview of the different specimens of turquoise continued to weave the threads of the exhibition into one pattern, a larger picture which would transform the work in the final room from simply being pieces of jewelry into treasures. In the last gallery, the exhibit seemed to open up into a world of awe. Jewelry laden with semiprecious stones dwelled in brightly lit display cases set into the floor and walls of the chamber, and each work a masterpiece. Festooned with colors that contrast and complement each other in coordination, layered and augmented to form graceful shapes and beautiful configurations, these bracelets, necklaces, rings and belt buckles are a living reflection of nature’s myriad incarnations. BLUE CORN BRACELET by Lee A. Yazzie of Bisbee and Royal Web turquoise, lapis lazuli, coral, opal, fourteen karat gold, 9.53 centimeters long, 1980. Collection of Joe and Cindy Tanner. Photograph by Kiyoshi Togashi. It is the intention behind every piece which distinguishes them from other contemporary American art jewelers. One can see that a narrative is being strongly woven, from start to finish, encapsulated neatly and entirely in materials that titillate the senses. A bracelet by Lee Yazzie entitled Blue Corn uses Bisbee and Royal Web turquoise, opal and coral with gold to subtly emulate one of the staples of the Navajo diet. It is an homage to Mother Nature and the blessing she bestows upon the people of the earth. The bracelet is at once reminiscent of an ear of corn, and yet also transcends it, like a physical manifestation of a perfect essence. The jeweled form seems somehow to loom larger than the sacred plant itself. Other pieces are like paintings in miniature, stories rendered in abstract by carved stone and hand-wrought metal. Raymond Yazzie’s Blessings bracelet is a riotous panoply of colors and shapes, as if a great spirit’s pouch of wonders was upended and strewn across a crystal blue sky. However, upon closer inspection one saw figures adorned with jewelry, faces, stars interpreted by gold crosses, and other imagery, many from a vocabulary of symbols that are part of the tradition of Navajo art and spirituality. Others are inspired by the work of Hopi artist Dan Namingha’s abstract paintings of katsinas. Raymond has taken Namingha’s two-dimensional art and interpreted it his way, with a palette of stones. All of this is accomplished with impeccable technique which winds the whole ensemble into one tightly wrapped package, a gift for the wearer. Lee’s specialty is silverwork, while Raymond’s preferred route of artistic expression is inlay. However, both jewelers are well-practiced in a broad range of techniques. Lee is known for having pioneered the Mosaic Turquoise technique where he takes multiple pieces of turquoise, and cuts them just so, such that one magnificent, unbroken expanse of stone is made from several separate parts. The method requires a careful eye, to see the pattern within the turquoise and to cut portions so that the veins that run within match up approximately. It also needs a steady hand to set each stone into the metal framework so that no seam can be seen. BLESSINGS BRACELET by Raymond C. Yazzie of Water Web Kingman and other turquoise, black onyx, Australian opal, lapis lazuli, sugilite, coral, gaspeite, and fourteen karat gold, 2002-2003. This piece is made from four hundred eighty-five stones. Collection of Daniel Hidding. Photograph by Gregory R. Lucier, Windsong Studio, L.L.C. Raymond’s use of color and tightly compacted stone inlay is his strong suite. A ring he crafted in 2012 presents all these elements in a richly detailed package. Drawing again from the wellspring of Navajo symbolism that forms the underpinnings of the Yazzies’ work, deep bluish slabs of turquoise are married to bold pieces of coral. Gold elements are interspersed throughout the rim of the ring, speckled with opal and sugilite. It is in the study of contrasts—the judicious arrangement of bright and dark, primary and secondary, with complex motifs arising from the miniature protrusions of semiprecious stones from the matrix—that such a satisfying and attractive ensemble is realized. Both Lee and Raymond began silversmithing at a young age, and gained many accolades as they began their path through life as jewelry artists. Sometimes the early work is just as fascinating as their more recent pieces. A squash blossom necklace fabricated by Lee in 1975 takes a traditional Navajo form and tweaks it slightly, making something graceful, simple, elegant, and utterly modern. Native work has to adhere to certain rules and guidelines for it to resonate, for the path back to the old ways to be clear, for the form to be recognizable and for the symbolism to be true, but finding the middle way, where that traditional imagery is properly represented yet something new, fresh and alive is imbued within it, is magic. As Lee says of the piece, “I just wanted something a little more streamlined, a little bit more select. So I just combined my experience as a lapidarist with my traditional upbringing. That’s the way we progress. We’re taught something and then we learn new things and incorporate them.” The result is something both new and old. The rest of the nine siblings who make jewelry were also given their due. Mary Marie Yazzie takes delicious, large chunks of turquoise and rings them with silver; one particularly unusual piece is a squash blossom necklace where raw, veined Lone Mountain turquoise ovalettes are overlaid on twin strands of silver beads, with an upended U or horseshoe shape of the ovalettes forming the flower-like pendant. Silver squash blossom buds peek out laterally from each ovalette. Cindy, Lillie, Lola, Marie, and Shirley Yazzie are all gifted in the art of making traditional silver beads, also known as “Navajo pearls” for how they resemble that gem from the ocean depths, and their work was shown as well. The exhibition was accompanied by a fifteen minute video whose prelude is a repeating segment filming a train on the tracks, passing through Gallup. Once the video itself began, viewers were treated to an interview of Lee and Raymond, shepherded by the commentary of curator Lois Sherr Dubin and Vivian Arviso, a Navajo educator and former Chair of the Southwest Association for Indian Arts. In this cinematic complement, the artists are humanized and made real, rather than bodiless entities existing behind the curtain of their jewelry. Imperfect, striving to better themselves with each piece they create, and ultimately modest about their capabilities, the two brothers reveal the immense human effort required to create these seemingly flawless works of art. Dubin herself sums up this family of craftspeople with her own characteristically insightful observation. “I do not see a difference between the way they live, the way they think and what they create. So, it’s all of a piece,” she explains. In this way, then, the jewelry of the Yazzies is a beautiful metaphor for the path of life tread by those who are makers. “Glittering World: Navajo Jewelry of the Yazzie Family” showed from November 13, 2014 through January 10, 2016, and was accompanied by a catalogue, written by Lois Sherr Dubin. The Glittering World video can be seen on Youtube, at www.youtube.com/watch?v=myfjje5ej1s. Patrick R. Benesh-Liu is Associate Editor of Ornament and continues to find time to enjoy craft in between writing, travel and tech support. Last year he attended “Glittering World: Navajo Jewelry of the Yazzie Family” at the National Museum of the American Indian in New York, and found it an enchanting and thoughtfully produced experience. His coverage of the exhibition explores the work of the Yazzies, as well as expressing his appreciation for its presentation. In addition, he contributes his own perspective on the Tucson Gem & Mineral show. 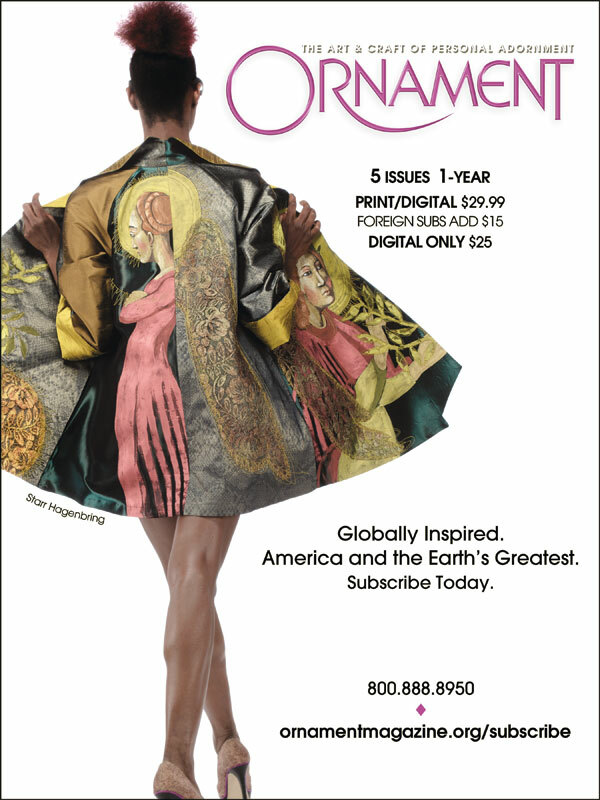 As Ornament’s resident reporter, he provides a zesty compilation of the latest craft News, where you can find out what is happening with art-to-wear in your local corner of the world.